A falling star lands in a Michigan farmyard and causes a big commotion. Soon its magic spreads through the town, creating a carnival atmosphere, changing the lives of all who see and touch it. 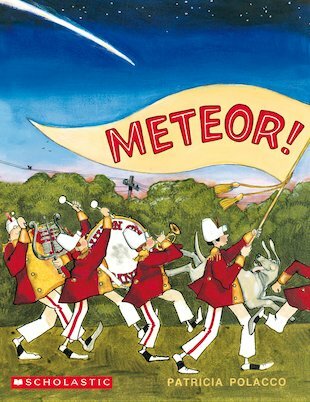 Merchants close their shops, school is let out early and everyone flocks to see the mysterious meteor. Soon the Coldwater Chautauqua Circus, the Union City High School Band and the hot air balloon man are heading the parade of citizens who want to see the fallen star. And all the folk who touch it feel special, inspired by the magic of something that has flown across the galaxy… A beautifully illustrated picture book about how an extraordinary event transforms the people of a small American town.